پساب حاصل از فرایندهای صنعت مس از نظر حجم تولید، بار آلودگی‌های زیست ‌محیطی و هزینه تصفیه و دفع اهمیت زیادی دارد. بازیابی این پساب، علاوه بر مزایای اقتصادی موجب کاهش بار آلاینده‌های محیط ‌زیست می‌شود. این موارد لزوم بررسی روش‌های مختلف برای کاهش میزان آب مصرفی و پساب خروجی را نشان می‌دهد. در این پژوهش به بررسی کمینه‌سازی مصرف آب و تولید پساب در مجتمع مس خاتون آباد پرداخته شد. روش مرسوم کاهش آب و روشی نوین با نام فناوری پینچ آبی برای این منظور توضیح داده شدند. در این پژوهش، فناوری پینچ در سه واحد پر مصرف در مس خاتون‌آباد برای سه شاخص آلایندگی شامل جامدات معلق کل، جامدات محلول کل و کدورت مورد بررسی قرار گرفت. نتایج این پژوهش و به‌کارگیری روش پینچ به‌منظور تصمیم‌گیری برای تصفیه و استفاده مجدد از فاضلاب، نشان می‌دهد که برای جامدات معلق کل، جامدات محلول کل و کدورت به عنوان شاخص آلایندگی به ترتیب می‌توان 614، 525 و 451 مترمکعب در روز در مصرف آب خام معادل 96/40، 35 و 30 درصد صرفه‌جویی نمود. با توجه به نتایج پژوهش، فناوری پینچ توانسته به پژوهشگران در جهت تصمیم‌گیری‌های لازم برای کاهش آب مصرفی کمک کند. همچنین با توجه به نتایج مشاهده شده، جامدات معلق مبنای تصمیم‌گیری برای کاهش مصرف آب محسوب می‌شوند. The effluent from copper industries is important in terms of production volume, environmental pollution and cost of treatment and disposal. In addition to its economic reasons, the effluent recovery also reduces the pollutant load. Such cases therefore prove the necessity of investigating different methods for reducing water consumption and effluent generation. This study investigated the minimization of water consumption and effluent production in Khatoon Abad copper refinery plant. For this purpose, the conventional method of reducing water consumption and a new technology called water pinch were explained. The water pinch technology was examined for three pollutant indices (TSS, TDS and turbidity) in three high consumption units of Khatoon Abad copper refinery plant. For TSS, TDS and turbidity as pollutant indices, total 614, 525 and 451 cubic meters of raw water consumption per day equivalent to 40.96, 35 and 30 percent could be saved, respectively. According to the results, the pinch technology could help researchers to make decisions for reducing water consumption and according to the observations, suspended solids are regarded as the basis for reducing water consumption. Minimization of water consumption, Water pinch, Mass transfer networks, Water reuse, Total suspended solids, Turbidity. APHA, 2005, Standard methods for the examination of water and wastewater, 21st Ed., American Public Health Association/American Water Works Association/Water Environment Federation, Washington, DC, USA. Brouckaert, C. & Buckley, C., 2003, The application of pinch analysis for the rational management of water and effluent in an industrial complex, Water Research Commission Report, Pretora, USA. Dunn, R. & Bush, G., 2001, "Using process integration technology for cleaner production", Journal of Cleaner Production,9 (1), 1-23. Feng, X. & Deng, C., 2013, Synthesis of water networks with water loss and gain via an extended pinch analysis technique minimisation of energy and water use, waste and emissions, Woodhead Publishing, London, UK. Hallale, N., 2002, "A new graphical targeting method for water minimisation", Advances in Environmental Research, 6 (3), 377-390. Juliana, F., Gomes, S., Eduardo, M., Queiroz, F. & Pessoa, L., 2007, "Design procedure for water/wastewater minimization: Single contaminant", Journal of Cleaner Production, 15 (5), 474-485. Khezri, S., Lotfi, F., Tabibian, S. & Erfani, Z., 2010, "Application of water pinch technology for water and wastewater minimization in aluminum anodizing industries", International Journal of Environmental Science & Technology 7 (2), 281-290. Manan, Z., Wan Alwi, S. & Ujang, Z., 2006, "Water pinch analysis for an urban System: A case study on the Sultan Ismail Mosque at the Universiti Teknologi Malaysia (UTM)", Desalination, 194 (1), 52-68. Manan, Z., Wan Alwi, S. & Ujang, Z., 2006, "Water pinch analysis for an urban system: A case study on the Sultan Ismail Mosque at the Universiti Teknologi Malaysia (UTM)", Journal of Environmental Management 194 (1-3), 52-68. Mann, J. & Liu, Y., 1999, Industrial water reuse and wastewater minimization, McGraw Hill, NewYork. Mehrdadi, N., NabiBidhendi, G. & Mohammadnejad, S., 2009, "An overview on different water pinch, methods for industrial water and wastewater minimization", Environmental Sciences, 6 (4), 29-42. 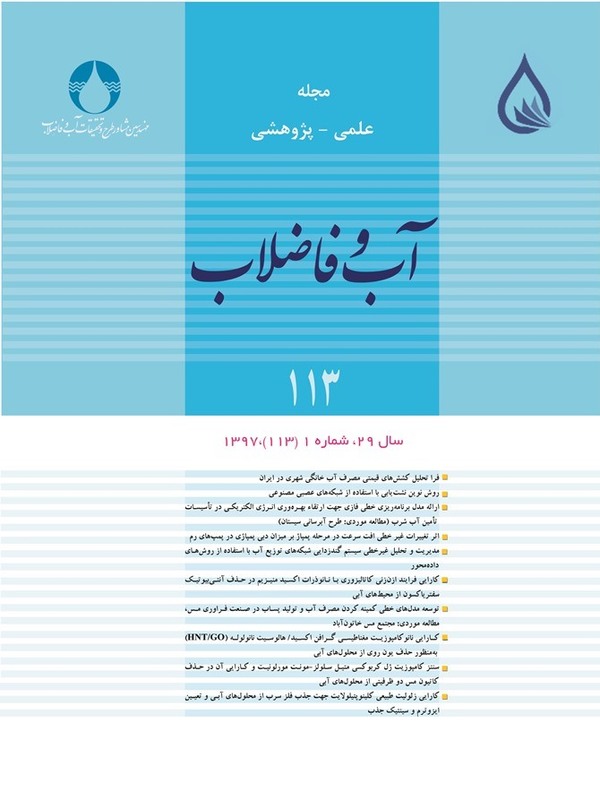 Mohammadnejad, S., Ataei, A., NabiBidhendi, G., Mehrdadi, N., Ebadati, F. & Lotfi F., 2012, "Water pinch analysis for water and wastewater minimization in Tehran oil refinery considering three contaminants", Environmental Monitoring Assessment, 184 (5), 2709-2028. Mughees, W. & Al-Ahmad, M., 2015, "Application of water pinch technology in minimization of water consumption at a refinery", Computers & Chemical Engineering73, 34-42. NabiBidhendi, G., Mehrdadi, N. & Mohammadnejad S., 2010, "Water and wastewater minimization in Tehran oil refinery using water pinch analysis", International Journal of Environmental Research 4 (4), 583-594. Priya, G. & Bandyopadhyay, S., 2016, "Multiple objectives pinch analysis resources", Conservation and Recycling, (In Persian). Qiao, Z., Minbo, Y., Guilian, L. & Xiao F., 2016, "Relative concentration based pinch analysis for targeting and design of hydrogen and water networks with single contaminant", Journal of Cleaner Production 112 (5), 4799-4814. Rafidah, S., Alwi, W. & Manan, Z., 2013, Water pinch analysis for water management and minimisation: An introduction minimisation of energy and water use, waste and emissions, Woodhead Publishing, Pretara, USA. Savelski, M. & Bagejewicz, M., 2000, "On the optimality conditions of water utilization systems in process plants with single contaminants", Chemical Engineering Science, 5 (21), 5035-5048. Tan, Y., Manan, Z. & Foo, D., 2002, "Water minimisation by pinch technology – water cascade table for minimum water and wastewater targeting", paper Presented in 9th Asian Pacific Confederation of Chemical Engineering (APCChE 2002), New Zealand. Ujang, Z., Wong, L. & Manan, A., 2002, "Industrial wastewater minimization using water pinch analysis: A case study on an old textile plant", Water Science Technology, 46 (11-12), 77-84. Wan Alwi, S., Manan, Z., Samingin, M. & Misran, N., 2007, "A holistic framework for design of cost- effective minimum water utilization network", Journal of Environmental Management, 88 (2), 219-252. Winterbone, D. & Turan, A., 2015, Pinch technology, advanced thermodynamics for engineers,Elsevier Pub., Amesterdam, Netherlands.